Abstract: It is not easy to identify damage modes and even determine the stress levels for onset of various damage mechanisms with a single mechanical test in polymer composites. Because their stress-strain responses do not provide a clear yield point or stiffness degradation during loading. 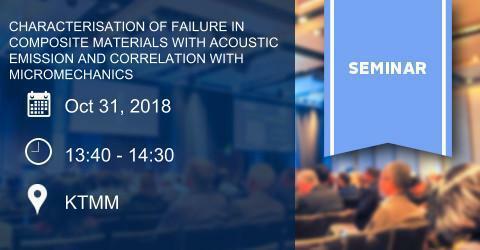 This talk involves the use of Acoustic Emission (AE) technique for damage mode identification during tension tests of Carbon Fibre Reinforced Polymer composites. Optical instruments are used to obtain reliable correlations between the damage modes and the registered AE events. First, the results of unidirectional laminates, having artificial defects in the form of slits are presented. Tension tests are stopped at certain stress levels before the ultimate strength and specimen edges are investigated with optical microscope to identify damage modes and correlate with AE characteristics. Then results are compared with predictions of a progressive damage model implemented using Finite Element Micromechanical Model and a very good consistency is achieved.In the second part, Digital Image Correlation (DIC) and in-situ edge observation are applied simultaneously during the tension tests of different quasi-isotropic laminates. They provide robust evidences for damage mode correlations. The k-means++ clustering algorithm is used to group similar AE events. It is found that damage progression and their AE characteristics are affected with lay-up sequence. The results to be presented during the talk put the reliability of AE based damage mode classifications, widely adopted in literature, in question and a new classification scheme is proposed.